The driver is based on the NexStar protocol. When using the driver for the first time, ensure to set the telescope's aperture and focal length in the Options tab. Also, set the geographical location and park position in the Site Management tab. Click the Save button on the Options tab to store these settings. 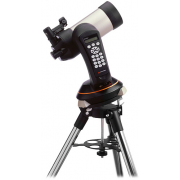 Go to the Connection tab and select the the serial port the telescope is connected to. Baud rate should be 9600. Click the Auto search option if you want INDI to search the telescope in all the available serial ports. Note: in Debian-based GNU/Linux distributions (like Ubuntu or Mint) the user must belong to the dialout group to be able to use the serial port. The Connection field allows you to connect and disconnect the mount according to the options indicated in the Connection tab. Track: the telescope will slew to the target location and then engage tracking using the tracking mode selected in the Track Mode field. Slew: the telescope will not start tracking after reaching the target. Sync: Update the telescope coordinates without moving the motors. Tracking can be engaged and disengaged by pressing the On/Off buttons in the Tracking property. Most of the functions of this panel are available through the contextual menu shown by clicking the left mouse button in the KStars sky map, so the user don't need to enter the target coordinates manually. Polling period: The INDI driver reads values from the mount periodically. The reading period in milliseconds can be changed using this field. are created to select how to direct debug output. Watch a video on how to submit logs. to restore default settings that were shipped with the driver. Hibernate: Enable or disable mount hibernation. This panel allows you to manually control the movement of the telescope. Button labels here are self-explanatory. Parking: By default, the parking position is at the celestial pole. To restore parking position to its default value, click the Default button under Park Options. Enter the desired AZ & ALT values for the custom parking position. Slew the mount to the desired parking position, then press Current. Press Write Data to save the new parking position. The mount must be unparked before you can set a new parking position. You can park the telescope by clicking on Park on the Main Control tab. If the telescope is already parked, click the Unpark button to unpark it. You cannot perform any motion unless the telescope is first unparked.